If you're over 70 and typically have just toast and jam for breakfast, you might want to add a portion of protein to your meal. While a serving of protein at breakfast is a good idea at any age, new research suggests that eating the right amount of protein daily (and at the right times) is even more important for maintaining optimal health when you're over 70. While many people easily meet the recommended daily intake of protein in young adulthood and middle age, as you edge past 70, your body may become less efficient at using the protein in the food you eat. That means that even if you're eating the same amount overall as you did at age 50, you may not be deriving adequate protein now. While general guidelines for the entire adult population used to recommend consuming 0.8 g of protein for every kilogram of body weight per day (0.8 g/kg/day), Carol Greenwood, a specialist in geriatric nutrition at the University of Toronto, cites recent nutrition research suggesting that people over the age of 70 should get at least 1 g/kg/day of protein. "For the average 50-year-old, 55-70 grams of protein each day is likely enough," says Greenwood. "But new data points to the 0.8 g/kg/day being a bit low for people over 70, so a range of 70-85 grams is probably a healthier target." What If You're Not As Hungry as You Used to Be? 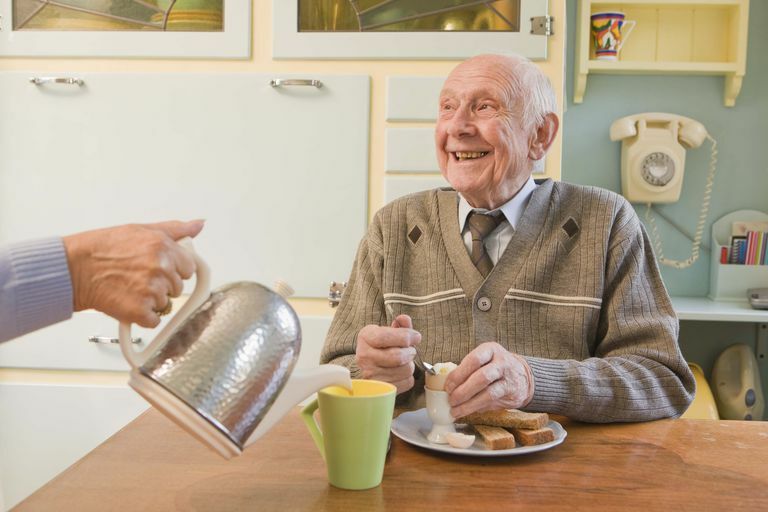 A challenge for many older adults is that as they age, their sense of taste begins to change. In addition, a diminished sense of smell can make even favorite foods taste different or less appealing. You may not feel like eating as much as you used to, putting you at risk for not getting enough nutrients. "Most older adults just don't have the appetite they used to have," Greenwood observes. "This is true even for healthy, community-dwelling older people; they just can't eat the quantities they did when they were 50. As their appetite declines, there's less room for empty calories, so they have to be careful to eat more protein than they used to even if they don't feel like it." Another consideration is how often you eat protein during the day. Younger adults have the ability to store small amounts of amino acids (protein's building blocks) from one meal to the next, but that changes in people around the age of 70, according to Greenwood. "The new evidence tells us that for people 70 and older, the window of time between protein meals must be shorter than in younger people. You shouldn't count on having a steak for dinner, and then no protein until tomorrow night's dinner. Every meal should have some healthy source of protein in it." Healthy lower-fat sources of protein include poultry, fish, dairy, and eggs. A 3 1/2 ounce (100 g) chicken breast contains about 30 grams of protein; 1/2 cup of cottage cheese, about 15 grams. Greek yogurt—a great addition to toast and jam in the morning—offers about 15 grams of protein in half a cup. A large egg delivers about 6 grams of protein. Plant-based sources of protein include seeds like hemp hearts (10 g of protein in a 30 g or 3 tbsp serving), and nuts which have been linked to greater longevity but not necessarily weight gain despite being high in calories. "I know this is not the way we traditionally eat our daily protein allotment," says Greenwood. "But you should aim to eat about a third of your daily protein at each of breakfast, lunch, and dinner." As you become older (over 70), you may become less efficient at using and storing the protein in the food you eat. Your appetite may diminish, so you may need to make an extra effort to get enough nutrients. Space your protein intake evenly throughout the day. Campbell WW1, Johnson CA, McCabe GP, Carnell NS. "Dietary protein requirements of younger and older adults." Am J Clin Nutr. 2008 Nov;88(5):1322-9. Carol Greenwood, Professor. Department of Nutritional Science, University of Toronto. Interview conducted by phone April 1, 2014. Dietary Reference Intakes (DRIs): Recommended Intakes for Individuals, Macronutrients. Food and Nutrition Board, Institute of Medicine, National Academies Guidelines.